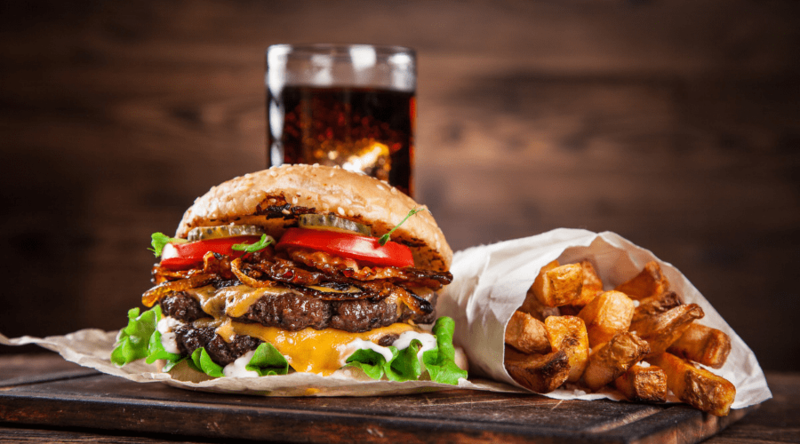 50 Unique Homemade Burgers to Explode Your Taste Buds! 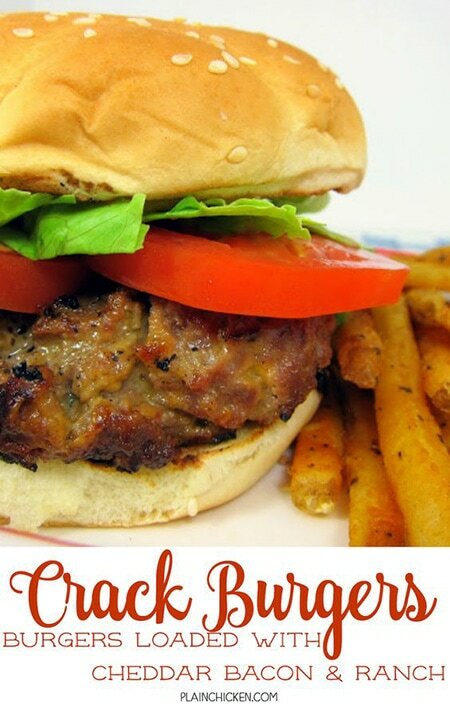 We all have that one go-to homemade hamburger recipe that we instantly use. It’s always the same; meat, spices, egg, bread crumbs, mush, grill. But what if you could do more? What if you could make homemade burgers that could rival the fanciest of restaurants and evoke jealousy from a Top Chef? Well, maybe that’s going a little too far. But if it’s easy enough, then why not? 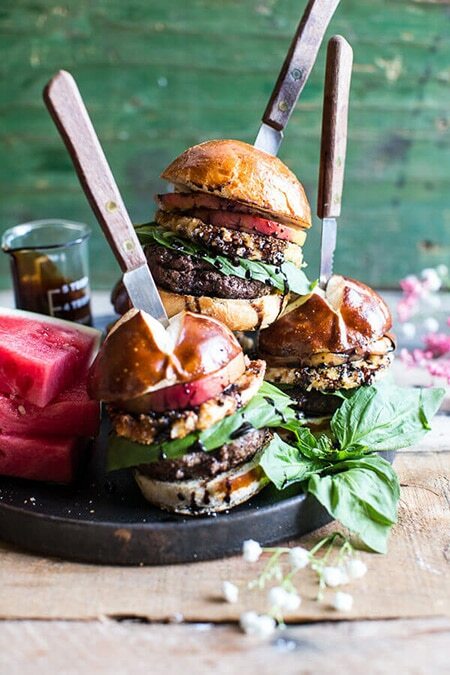 Amp up your boring patties and try some of these unique homemade burgers this weekend! Loosely shape your burgers and season them really well with kosher salt and pepper. Make a big dimple in the center of each burger. As it cooks the burger will shrink in a bit and take up this space in the center. Toss these burgers on a medium-high grill for about 4-5 minutes per side for a medium burger. Try not to fuss with them too much. After about five minutes, give the burgers a flip. You will hopefully have some nice grill marks and a good crust developing on the burger. 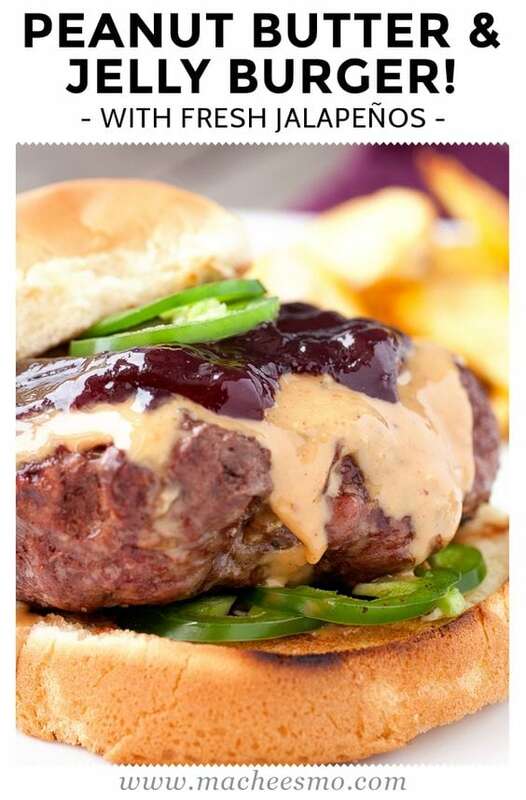 Pile on about a tablespoon of creamy peanut butter and let it heat up on the burger for a minute or two. It may sound crazy but warm peanut butter and warm cheese have a very similar texture which, as you may know, works very well on burgers. Riding that peanut butter train, we present the mother of combinations: peanut butter, maple, and bacon. All slapped on a toasted whole wheat bun. Yum-o. Seriously, if this doesn’t look tasty to you then you need to get your buds checked. In large bowl, combine ground beef, salt and pepper. Form beef into 4 patties and grill to desired doneness. Top burger patties with 2 slices cheddar cheese, if desired. In microwave oven, warm peanut butter 30 seconds. Place burger patty on bun. Spread warmed peanut butter on top of patty generously. Top with 2 to 4 slices bacon and add burger bun. Thai food lovers rejoice! If you’re contemplating between Thai food or homemade burgers tonight, then try this baby! At first, you’d think this would be gross. But the kick of Asian inspiration paired with the creamy peanut butter and dreamy bacon is so freakin’ good. Start with a toasted bun and a squirt of sriracha on the top and bottom. It’s up to you how much and how hot you want it. Put a burger patty on the bun while still warm drop a heaping dollop of peanut butter on top of the patty. Lay two pieces of crispy bacon on the peanut butter.Then comes the grilled pineapple. Lay another thin warm burger patty on top of the pineapple, sandwiching everything between the two patties. Top with fresh cilantro leaves. As if burgers weren’t full of calories as it was. But hey, who cares? 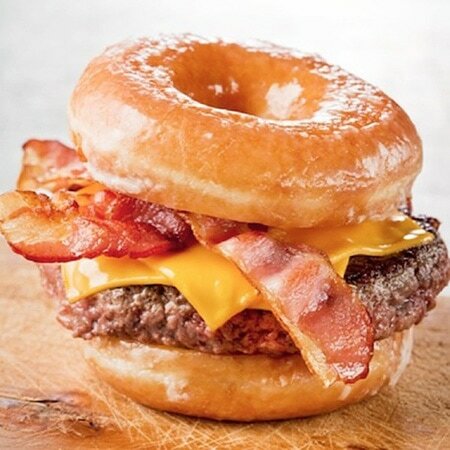 A burger on a soft, chewy, decadent donut? Yes, please! Now, you could be calorie conscious and slice a donut in half to use as the bun, or you could just go nuts and use two whole ones. We’re not judging. Just so this list is mouth-watering as well as informative, we’re throwing this one in. 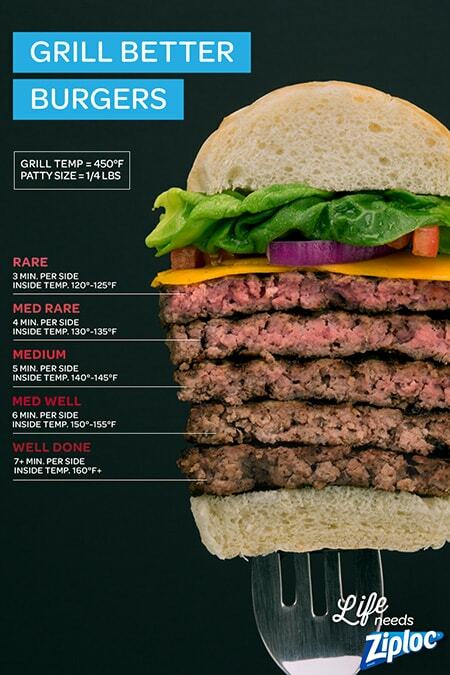 For those inexperienced grillers, this is a perfect chart (made of meat, of course) to clearly show how to tell if your patties are done to your liking. Here’s another helpful tip; only the top three matter. Hey, save yourself some time and have the main course and dessert all in one! Just kidding, you’re totally having some ice cream after this. 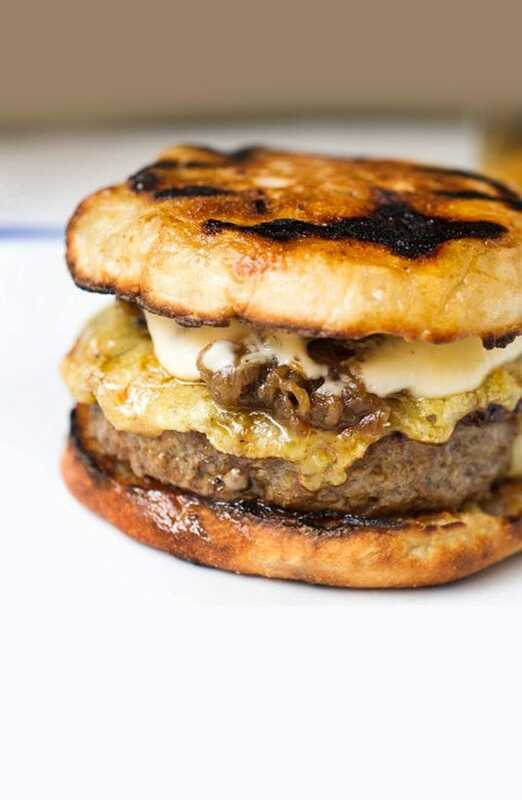 But the caramelized peach slices add a juicy layer to this awesome burger. You could use any kind of cheese, but mozzarella is definitely the best for this combo. Balsamic Drizzle Add vinegar and brown sugar, if using, to a small saucepan and bring to a boil. Reduce to a very low simmer and cook for 10-15 minutes, until liquid reduces by about half and is slightly syrupy. Remove from heat, pour vinegar in a bowl or glass to pour, and set aside to cool and thicken. Divide the meat into 4 sections and form into 4 patties (or make 8 slider size burgers). Place the patties on a plate. 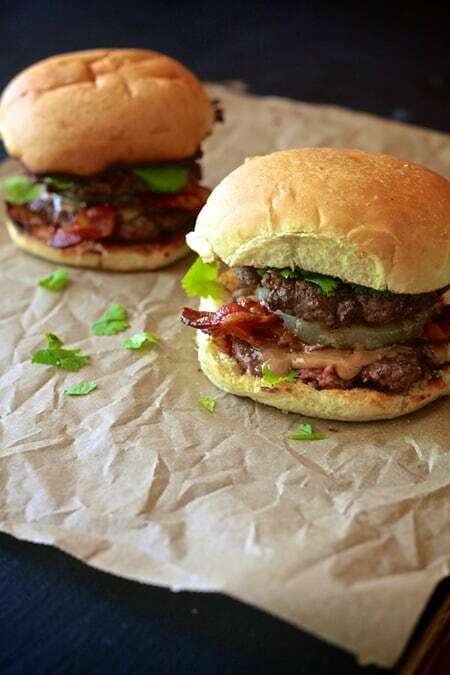 Drizzle the burgers with balsamic vinegar. In a large bowl, combine the Panko, flour, parmesan, salt, pepper and cayenne, mixing thoroughly to combine. In a small bowl, lightly beat the eggs. Take each slice of fresh mozzarella and coat it in the beaten egg, then dredge it through the bread crumb mix, pressing on both sides to adhere. Repeat with the remaining slices. Drizzle the peaches with honey (or sprinkle with brown sugar). Preheat the grill or a grill pan to medium-high heat, once hot, season the burgers with salt and pepper and then grill until your desired doneness. About 4-5 minutes per side for medium-rare. 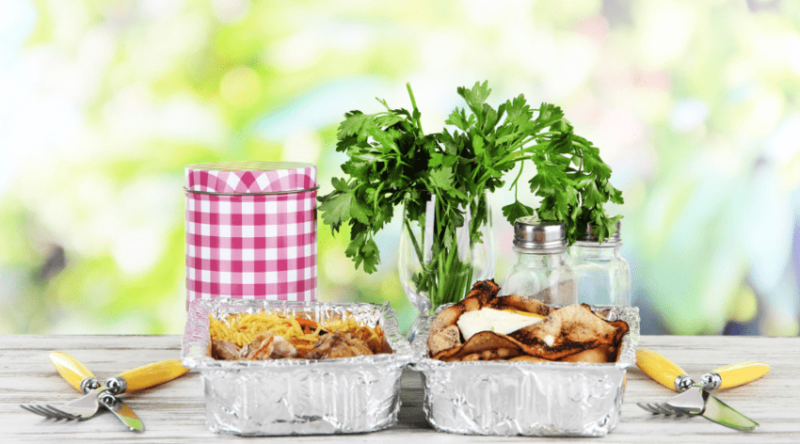 Remove the burgers from the grill and and cover with foil to allow the burgers to rest while you fry the mozzarella. Heat a large skillet over high heat. Add 1 teaspoon of olive oil and sear both sides of the peaches for 1 to 2 minutes until just warmed, but still somewhat firm. Alternately you can also grill the peaches directly on the grill. Add the remaining olive oil to the skillet and when hot, fry the coated mozzarella, turning carefully once or twice, until golden and cheese begins to melt but still retains its shape, about 1 minute on each side. Drain on paper towels. To assemble, divide the burgers among buns. Top with a couple fresh basil leaves, a slice of fried mozzarella and a couple slices of caramelized peaches. Drizzle with balsamic glaze. Add the top bun. Combine the garlic, onion, Worcestershire, and beer in the bowl of a food processor. Pulse until the a smooth paste forms; I like the onions and garlic to blend completely. Pour the paste into a mixing bowl and stir in the spices, salt, and pepper. Fold in the panko breadcrumbs and ground meat and mix to combine, being careful to not overwork the meat. Form the mixture into four equal patties. Heat a grill to medium-high and add the burgers. Cook for 4 minutes per side. 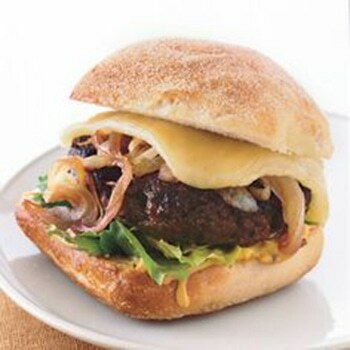 During the last minute of cooking, top each burger with gouda cheese and close the lid of the grill so the cheese melts. Remove from grill and tent the burgers with foil until ready to serve. Whisk together the Dijon mustard, egg yolks, and lemon juice. Whisking constantly, slowly stream in the oil until the mixture thickens and emulsifies. Whisk in the whole grain mustard and horseradish and season to taste with salt and pepper. This can be made ahead and kept in the fridge until serving time. To Serve: Serve the burgers on buns with desired toppings and the aioli. Not all of us have a fancy schmancy grill out on the deck. Heck, some of us don’t even have a deck. But that doesn’t mean you can’t enjoy a mouth-watering burger like the rest of them! 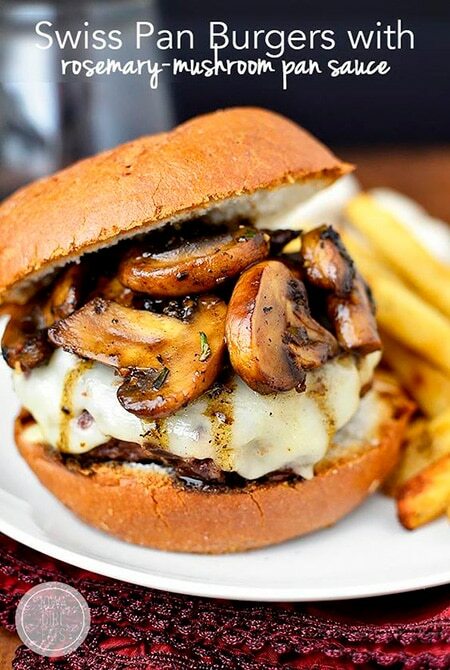 This single pan burger concoction is heavenly with mushrooms, rosemary, and Swiss cheese…my mouth is filling with saliva just typing this. Combine ground beef, 2 Tablespoons shallots, 2/3 of the minced rosemary, Worcestershire sauce, salt, and pepper in a large bowl then mix until combined. Create 4 burger patties then set aside. Heat extra virgin olive oil in a very large (10-12″) cast iron or heavy bottomed skillet. Add burger patties then saute for 4-5 minutes a side for burgers cooked to medium, add swiss cheese slices then allow to melt slightly (don’t let cheese melt onto skillet or it will burn.) Transfer to a plate then loosely tent with a piece of nonstick-sprayed foil. Melt 1 Tablespoon butter in skillet then add mushrooms and remaining Tablespoon shallots. Season with salt and pepper then saute until mushrooms are golden brown, 5 minutes. Add remaining rosemary and garlic then saute for 1 more minute. Add beef broth then simmer, scraping the bits up from the bottom of the pan, until sauce has reduced and thickened slightly, 5 minutes. Add remaining Tablespoon butter then stir until melted. Place burgers on buns then top with mushrooms and sauce. Alright, alright. Let’s throw in some healthy options, shall we? Even though this shrimp patty claims to be a smarter choice to beef, it still looks amazing, doesn’t it? 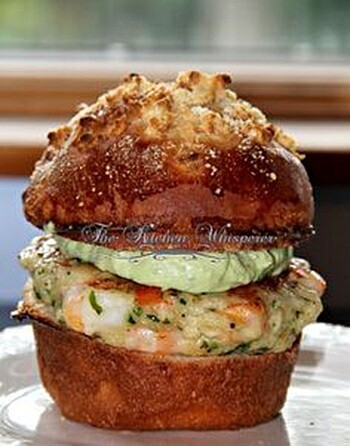 Who knew, crustaceans on a bun? It could work. Especially with the creamy avocado aioli sauce. Scoop the avocado pulp into the bowl of a food processor. Add the sour cream, lime juice, garlic cloves, jalapeno, cilantro, salt and pepper. Place in a dish, add the pit (this helps prevent it from turning brown), cover and chill for an hour. Divide the shrimp in half. Coarsely chop one half and set aside. Put remaining half in a food processor and grind to a coarse puree. Add egg, shallot, cilantro, jalapeno and garlic to processor. Sprinkle mixture with breadcrumbs and process again. Transfer contents of food processor to a large bowl. Add coarsely chopped shrimp and red pepper. Season with salt and freshly ground black pepper to taste. Mix well. Form burgers and chill for 1 hour (covered). Heat oil in a heavy skillet. When very hot, fry the shrimp burgers until golden, about 3 minutes per side, depending on thickness. Serve on a Onion Brioche Bun. a few generous shakes of spicy seasoning – cumin, chili powder, cayenne, etc. Preheat the oven to 400 degrees. Cook the quinoa according to package directions but only using 1 cup broth of water to keep it from getting too heavy. Cut the cauliflower into florets, transfer to a baking sheet, drizzle with 1 tablespoon oil and sprinkle with spices to taste. Roast for 20-30 minutes. Let cool. Pulse through a food processor to form small pieces that stick together (see picture). We don’t want PUREE here, but we do want enough mushiness to help it all stick together. Combine the cooked, pulsed cauliflower with the quinoa, garlic salt, breadcrumbs, Pepperjack cheese, eggs, salt, and another teaspoon or two of spicy seasoning (cayenne will make it hot-spicy, so just add a few shakes of that one). Form 10 patties. In an oiled or nonstick pan over medium heat, cook the burgers until golden brown on each side, flipping very carefully to avoid breaking. Set aside on a paper towel lined plate. Toss the lime juice, cilantro, cabbage, and a quick stream of oil together. Season with salt. 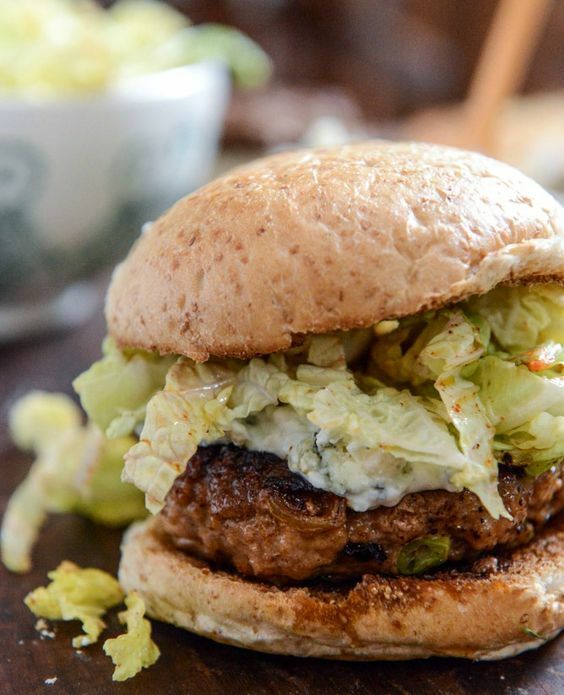 Arrange the burgers with: magic green sauce, the cauliflower burger, the slaw, and the chipotle mayo on top. 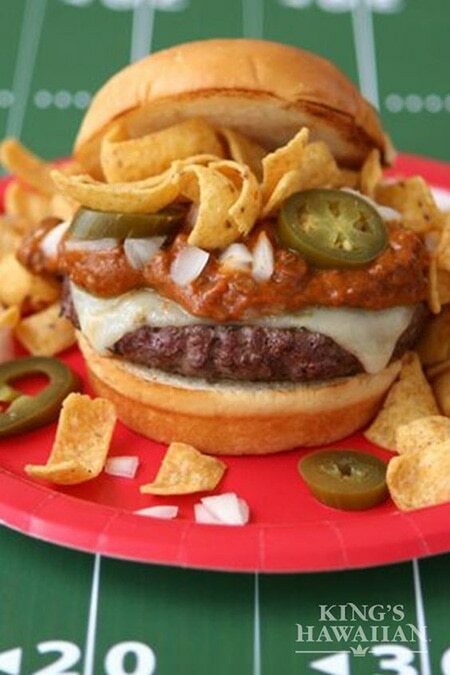 For those of you who love the spicy side of things, this crunchy chili burger is perfection. A basic homemade patty, but topped with chili, jalapenos, onions, cheese…oh, and corn chips. How else do you get the crunch? This sandwich is so messy but so worth it. Grill hamburger patties to your liking. Add cheese to the patty and allow to melt. Toast KING’S HAWAIIAN buns over indirect heat on your grill. If indirect heat is not an option, keep a very close eye on your rolls as they will toast fairly quickly over direct heat! Build your hamburger in this order: Bottom bun, hamburger patty w/ cheese, warm chili, chopped onions, jalapenos, corn chips, top bun. Oh yeah, you read that correctly. So, one of the main components of a burger is the cheese, right? So, why not kick it up a notch and instead of slapping on a slice, slap on a spoonful of macaroni and cheese? This sandwich combines two classic dishes; burger meets mac-n-cheese. A match made in food heaven. In a medium pot over low heat, melt the butter. Add the flour and stir thoroughly until there are no lumps. Cook, stirring, until the mixture is golden brown and smells toasty, about 1 minute, then add the milk. Bring to a boil and cook until the mixture thickens, 2-3 minutes. Add the macaroni and stir to coat evenly. Add the mozzarella and cheddar, stirring until cheese is completely melted and macaroni is coated evenly. Remove from heat. In a medium bowl, combine the ground beef, salt, pepper, and garlic powder. Gently mix until evenly combined Pinch off some ground beef and roll it into a 2-inch ball. Flatten the ball and then mold it into a deep pocket with your thumb. Place 2 tablespoons of the mac & cheese into the center of the pocket, then pinch the edges of the beef together. To seal, use another tablespoon of the beef mixture to close up the top, enclosing the mac & cheese completely inside the beef. Repeat with the remaining ground beef and mac & cheese to make 6 patties. In a pan over medium heat, cook the patties on one side for 2-3 minutes, then flip. Place a slice of cheddar on top, then cook for another 2-3 minutes, until the cheese is melted and the meat is cooked through. Remove from the heat. Slice the dinner rolls in half and serve the cheeseburgers on the buns, topped with the lettuce. Tired of beef patties? No, you’re not, but it never hurts to switch things up every now and then. Try this one on for size. 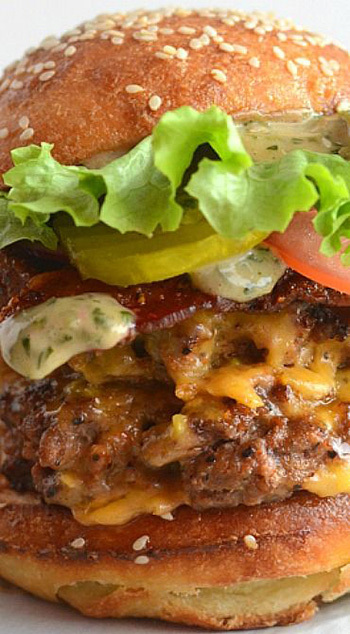 A Southern-inspired patty made of corned beef smothered in bacon and cheese. Oh, did I mention that Guinness is involved? Hmm, I left that detail out, did I? Add 1/4 cup Guinness , cover and simmer until the liquid has mostly evaporated, about 15 minutes and repeat three more times. Remove from heat and mix in the Worcestershire sauce and grainy mustard. Meanwhile, cook the bacon in a pan and set it aside on paper towels to drain. Form the ground corned beef into 4 patties and grill or pan fry over medium hight heat until cooked, about 3-5 minutes per side, topping with the cheese. Fry the eggs, assemble the burgers and enjoy! You could get really creative with burger toppings and flavors, couldn’t you? This Hawaiian infused sandwich with teriyaki sauce is proof of that. I would never have thought to put those ingredients on a bun, but it works so well. It’s sweet and delicious. But you have to try it for yourself to know for sure (wink, wink). Gently combine the ground beef with grated carrots, scallions, ginger, soy sauce and sriracha sauce. Form into 8 equal sized patties, try not to overwork the meat so it doesn’t get tough. Combine the cornstarch in cold water and dissolve. Set aside. Mix soy sauce, pineapple juice, brown sugar, grated ginger, and garlic in small saucepan over medium-low heat; bring to a boil and simmer until sauce reduces about 15 to 18 minutes. Add cornstarch-water mixture and simmer until thick, about 2 minutes. Remove from heat and set aside to cool. Heat the grill. When hot clean the grates and spray with oil. Place the patties on the grill and cook on high heat for about 5 to 7 minutes on each side, or until burgers are cooked to your liking. While the burgers are cooking, grill the pineapple slices for about 2 to 3 minutes on each side. To serve, place a piece of lettuce on the bottom of each burger bun. 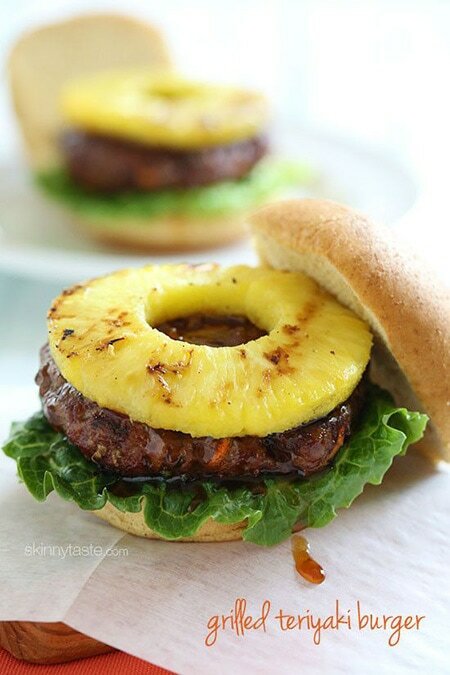 Top with the cooked burger and 1 tbsp of teriyaki sauce, then top with grilled pineapple. Let me paint you a picture. It’s a Friday night, your friends are over, you guys are having some drinks and enjoying an evening out on the back deck. Everyone’s getting hungry but there’s a clear division of requests; pizza and burgers. So what do you do? A pizza burger, of course! Start by adding the onions and a drizzle of canola or vegetable oil in a large skillet on medium-high heat. Heat through. Add the ground beef and cook all the way through. Once the meat is cooked, add the tomato soup, water, and pizza seasoning. Reduce to low and let simmer. While the meat and sauce are simmering, preheat the oven on broil and spread the butter evenly on each English muffin half. Sprinkle with garlic salt and top each with 4 slices of pepperoni. Pop these under the broiler on a cookie sheet for about 2 minutes or until they begin to brown just on the edges. 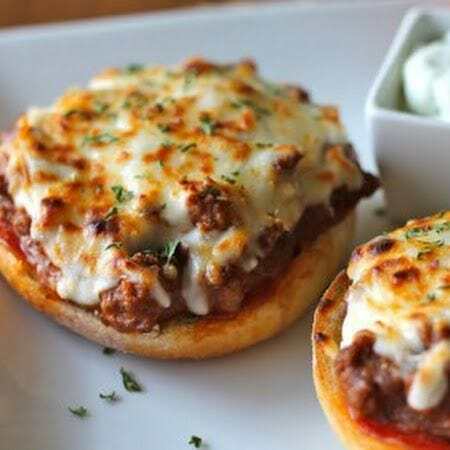 Take out of the oven and top each English muffin with about 1/4 cup of the meat and sauce mixture. Top each of those with the cheese. Place back under the broiler for another 2-3 minutes or until the cheese turns golden brown and bubbly. This is a cool take on the whole slider option. It still uses full sized buns, but after you cram them into a muffin tin they come out like this. Teeny, adorable burgers. Preheat oven to 350°F. Brush 12 regular-size muffin cups with melted butter. Press half of a bun, cut side up, into each muffin cup. In a large skillet, cook bacon over medium heat and transfer to paper towel-lined plate to drain. Discard drippings in pan. Add beef and onion to the skillet; heat to medium-high heat. Cook 5 to 7 minutes, stirring frequently, until beef is brown. Drain. Divide beef mixture evenly among muffin cups and top each with 1 teaspoon ketchup. Top each one with cheese. Bake 5-7 minutes or until cheese is melted. Immediately top with cooked bacon, followed by whatever toppings you want (relish, mustard, pickles, lettuce, tomato). Well, it’s about time we had a decent chicken option on this list, right? We made it all the way to #17 without adding one, but the wait is totally worth it. This recipe calls for ground chicken but I would imagine it’d be just as good with a tender, juicy chicken breast. But the star of this sandwich is the massive chunks of Caprese. Oh, so good. In a large bowl combine the ground chicken, pesto, salt and pepper with your hands until combined. Form the meat into 4 equal sized patties. Preheat grill or skillet to medium high heat. Spray or oil the grates of the grill or the skillet generously. Cook the chicken burgers for approximately 4 minutes per side depending on how thick they are. While the burgers are cooking prepare the basil aioli. Whisk together all of the ingredients for the aioli in a small bowl and refrigerate until ready to serve. About a minute before the burgers are done, place the buns cut side down on the grill and toast them until lightly brown. Assemble the burgers on the toasted buns and top with a slice of fresh mozzarella, a slice of tomato, 2-3 basil leaves, and some of the basil aioli spread on the top half of the bun. This is a tasty spin on an old classic, the BLT, and we’ll be darned if it’s not better than the original. Crispy bacon, lettuce, and tomato are still the main ingredients, but slip in a juicy beef patty and roasted garlic mayo and you’ve got this beast. 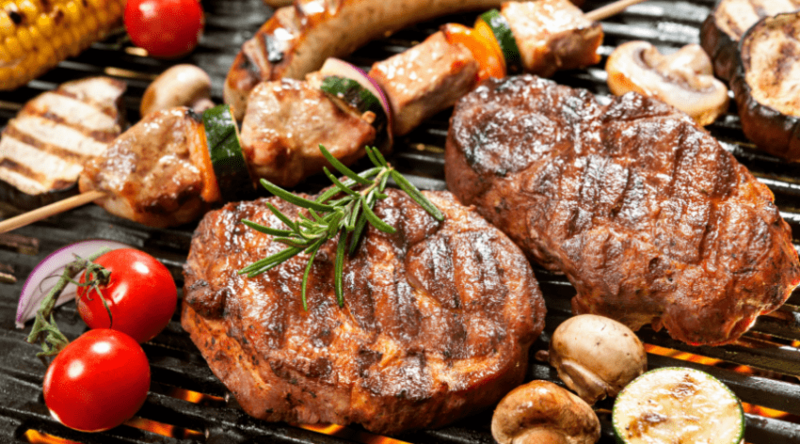 The hardest decision would be to choose between charcoal or gas BBQ to grill up your masterpiece. Make Roasted Garlic Mayo: Mash up roasted garlic cloves. Mix well with remaining sauce ingredients. Add salt and pepper to taste and mix well. Lasts for up to a week in fridge. For the Burgers: In a large nonstick pan, cook onions in the 2 TB oil over medium high heat, stirring often. Cook until very soft and golden brown, caramelized. Season with salt and pepper to taste. Set aside. In a bowl, liberally sprinkle ground beef with salt and pepper and mix to incorporate. Shape into 4 large patties, and keep at room temp. When ready to cook, grill burgers to medium rare or medium. Place cheese slices on top of the patties and keep warm. Assemble Burgers: Spread garlic mayo generously on buns. 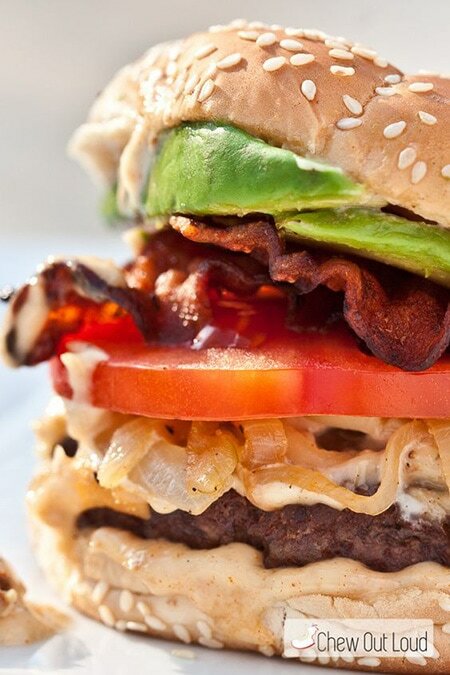 Layer on avocado, bacon, tomatoes, caramelized onions, and lettuce over warm cheese/beef patties. Because what hamburger list is complete without…a hotdog? In an attempt to spice up the age-old idea of a round, flat patty between two buns, this was created. Rather than form the regular patty that you’ve come to know, form a tube shape filled with cheese instead. Slap it on a hot dog bun and you get this! Magnifique! First, slice cheese into sticks (about the same size as string cheese). Then, season your ground meat for taste. Next, you want to split the meat into 5-6 palm sized balls. Flatten each ball out into a rectangle and place a cheese stick toward the bottom. Finally, roll it up to completely conceal the stick of cheese. Now that the rolls are ready, you wanna lay those soon-to-be burger dogs on the grill and breathe in the precious scent of happiness.Grill for 6-10 minutes, turning the dogs when charred grill marks appear on a side. For safety: turn it about 3 or 4 turns… or more to insure even cooking around each dog. Serve on hot dog buns and spread your fave condiments on it and SLAY your mouth. Aptly deemed the Crack Burger, this baby’s patty is infused with bacon, ranch, and loaded with cheddar cheese. So, really, you could just eat the meat and be happy. Screw the bun. Unless it’s one of those stellar soft pretzel types, then go for it. Combine all ingredients and form into 4 hamburger patties. Grill to desired temperature. The burgers will be very moist, be very careful when you flip them. Serve on your favorite hamburger bun topped with lettuce, tomato, mustard and mayo. So, you take a mound of beef and add a generous amount of French dip. Then you add bourbon fried onions and Havarti Swiss cheese? I’ll take two, please. Actually, make that three…and a side of fries. In a large bowl, combine the ground beef with half the salt and pepper to combine. Divide the mixture into four equal parts and lightly work to form four burger patties. Season with the remaining salt and pepper. Cover and set aside. In a large frying pan, heat the olive oil over medium heat and add the onions to the pan. Cook the onions until softened and golden brown, approximately 10-15 minutes. Sprinkle with the sugar and cook for an additional 2-3 minutes. Remove the pan from the heat and stir in the bourbon. Return the pan to the heat and cook for an additional 1-2 minutes. Stir in the thyme. Season with salt and pepper to taste. Set aside. Bring the beef stock to a simmer and stir in the thyme. Allow to simmer for 5-10 minutes and stir in the salt and pepper. Keep warm. Place the burger patties on the grill and cook for 3-4 minutes per side or until cooked to medium rare (internal temp will be 145 degrees). Top the burgers with equal amounts of cheese and turn the grill off. Add the rolls, cut side down, to the grill. Close the lid and allow the cheese to melt approximately 3-4 minutes. Transfer the burgers and rolls to a platter. Spread 2 tablespoons of horseradish sauce on the bottom of each roll and top each with a burger. Spread 2 tablespoons of onions on the top half of the roll and place on top of the burger. Serve each burger with 1/4 cup of beef broth. Really, you could take any popular international dish and turn it into a burger. This Mexican version is a prime example. Beef, salsa, spicy green sauce, cheese, lettuce, and tomatoes sandwiched between two toasted buns. It’s like a taco…but not. Shape into 4 or 6 patties; grill to desired doneness. Medium is recommended. This is a good choice for those cooler Summer evenings when you want some comfort food. Creamy provolone cheese smothers the patty. The onions and green peppers give it that Philly kick. This is an awesome burger, I ate two, and I don’t feel guilty. Mix ground beef and Seasoning Mix until well blended. Shape into 4 patties. Grill over medium heat 4 to 6 minutes per side or until burgers are cooked through (internal temperature of 160°F). Grill onions and bell peppers in grill basket or grill rack 3 to 4 minutes or until tender and lightly browned, stirring frequently. Add cheese slices to burgers 1 minute before cooking is completed. 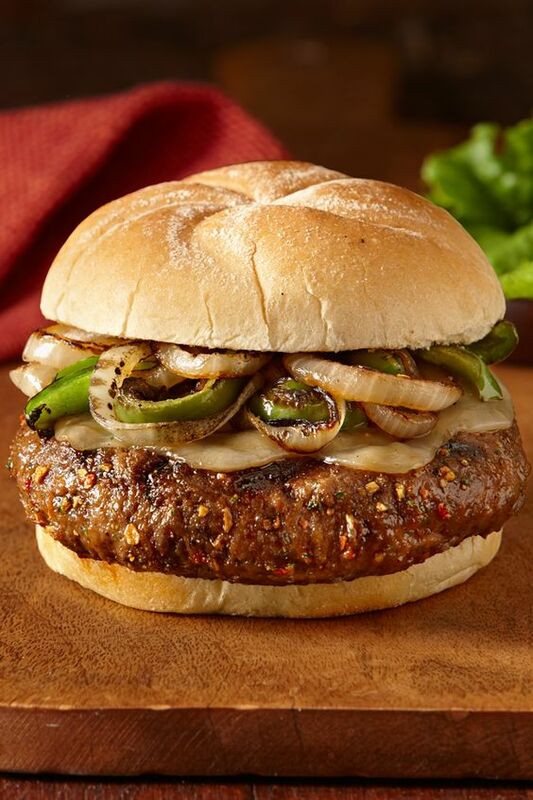 Serve burgers on rolls topped with grilled onion and bell pepper mixture. Hey! Here’s that wicked soft pretzel bun I mentioned earlier. Man, they are the bomb! Especially when you have a meatless burger such as this. The black bean patty is soft and delicious. The sweet potato adds a unique layer of tastiness. And the baked cheddar beer onions rings? Come on! In a bowl combine the quinoa, mashed sweet potatoes, mashed black beans, tomato paste, egg, chili powder, smoked paprika, cinnamon, cayenne, salt, pepper, brown sugar, and Worcestershire. Mix well to moisten the ingredients and then mix in the shredded cheddar cheese. Mix well again and form into 4 or 5 equal burger patties (I made 4). The mixture will be very wet and sticky, this is fine, just make rough circles. Place on a plate lined with wax paper and place in the fridge while you prepare the onion rings. Preheat the oven to 450 degrees F. Line 2 baking sheets with parchment paper. To make the onion rings, whisk together the flour, buttermilk, beer and dijon mustard in medium-size mixing bowl. In another shallow bowl, mix together the cheddar cheese cracker crumbs, Panko breadcrumbs, smoked paprika, salt, and pepper. Now take the slices of onion and dip them through the buttermilk/beer mixture, making sure they are completely covered in batter. Using your other clean hand, dredge the onion ring through the cheddar crumbs, coating completely. Place on the prepared baking sheet and repeat with the remaining onion slices. Once you have coated all the onions slices, lightly spray them with olive oil or cooking spray. Bake for 20 to 25 minutes, or until coating is crisp, flipping halfway through. Season with salt, to taste. While the onion rings are baking, cook the burgers. Heat a large skillet over medium heat and add 2 tablespoons olive oil. Remove patties from the fridge and place in the hot skillet. They will be moist and sticky. Cook for 5-6 minutes, then if needed add more oil and flip the burgers very gently (be gentle, they crumble easily when hot). Cook for another 5-6 minutes. It is important to not flip the burgers until they are ready. During the last minute or so of cooking add some cheddar cheese to the top of each burger, cover the pan and cook 2-3 minutes or until the cheese has melted. My burgers were a little moist and very delicate, if they break on you, just put them back together the best you can. Once you remove them from the skillet and they cool slightly, they will firm up. To assemble the burgers, place each burger on a bun (or lettuce), top with an egg and a few onion rings. I guess you could really make a patty out of any type of meat, even lamb. It gives a different kind of taste, but when paired with things like spinach, red onions, and feta cheese you get a pretty awesome combo of tastes. It’s definitely different but still very delicious. If you’re daring and adventurous, try it out. Mix first 4 ingredients and 1 1/2 tablespoons oil in medium bowl; mix in lamb. Shape into four 3/4-inch-thick patties. Cook patties in large nonstick skillet over medium-high heat 4 minutes per side for medium. Meanwhile, preheat broiler. Broil buns until golden, about 2 minutes. Top each bun bottom with burger. Toss spinach, feta, onion, vinegar, and 11/2 tablespoons oil in bowl. Place salad atop burgers. Cover with bun tops, pressing firmly to compact. Not sure if this is really a Hawaiian burger, but it’s for sure an ode to the tiny state. Start with a regular beef patty and add some pineapple, lettuce, bacon, and Swiss cheese. Voila! Or should I say, Pau? Prepare sauce by placing BBQ sauce in a bowl and adding 2 Tbsp of the pineapple juice. Stir together and set aside. Grill patties according to the directions on the box. Add cheese slices and allow to melt before removing from the grill. Spread 1 Tbsp sauce on the bottom part of each of the four buns. Cover with 1/4 c. lettuce and a patty. Break two bacon slices in half and set on top of patty. Then top with pineapple ring. Spread 1 Tbsp sauce on the inside of the top bun and top the burger. I actually made this burger not too long ago and it was TO. DIE. FOR. Mind you, I couldn’t find the “million dollar buns” listed in the ingredients, mostly because I have no Earthly idea what they are. But I use my beloved soft pretzel buns and it was so good! Prep the onions. Slice the onion into very thin rings. Use a mandoline if you have one. Place the sliced onions into a baking dish and cover with buttermilk. Set aside for an hour. Make the aioli. In a small bowl, combine mayonnaise, zest, lemon juice, Dijon, 1 clove garlic, and salt and pepper. Don’t add too much lemon juice or it will be too runny to stay on the burger. Throw it in the fridge. Form the burgers next. In a medium bowl use your hands to combine ground beef, red wine, 1 and 1/2 teaspoons salt, pepper, garlic, and green onions. Form into 4 patties at least 4-5 inches across. Press the centers of the patties down so that the hamburgers don’t get too thick in the middle when you grill them. See the how-to photos on this post if you’re feeling lost. Set the hamburgers aside on a plate. Cut the bacon in half and cook until crisp. Drain on paper towels. Heat 1-2 quarts oil (depending on the size of your pan) over medium-high heat (375 F) in a high-sided skillet. Combine the 2 cups flour, salt, cayenne, and black pepper in a medium bowl. Drain the buttermilk-soaked onions and add them to the flour, making sure they all get coated. When the oil is hot, add the coated onions, doing several batches. Stir them around so they don’t stick together. When they are golden brown, remove to a paper-towel lined plate. Repeat with remaining onions. You will probably have extra onions. Heat your grill to medium heat. Cook the burgers for 3-5 minutes, then flip. Spread 1 ounce of softened goat cheese on each burger, then cook for another 3 minutes or so, or until they are as done as you want them. Butter the cut sides of the Million Dollar Buns. Place on the grill and cook for 1-2 minutes until the buttered sides are crispy. Assemble the burgers: Bun, aioli, burger, goat cheese, bacon, onions. Add more aioli for good measure. Hey, we can’t have a massive list of JUST burgers. We need a bit of variety, don’t we? And who doesn’t love a good ol’ burger bomb? Come on, just the sound of it makes you smile. Cheese and meat wrapped in pastry, then fried to perfection. Dip in your favorite condiments and enjoy! This a favorite of mine, mainly because it uses Sriracha mayo. But the Asian slaw that’s slapped on the beef patty is so, so good when you bite into it. Spicy, crunchy, deadly. There’s no cheese listed in the recipe, but I went ahead and added a slice of Mozza for the heck of it. In a large bowl, combine all burger ingredients and mix well to thoroughly incorporate. Form into patties. Grill on preheated grill until patties are cooked to your liking. Medium is recommended. Serve with cabbage slaw, cilantro, and plenty of Sriracha mayo on buns. Another healthy turkey burger alternative, but this one was so much better than the last. I thought so, anyways. But I think it was the chili garlic slaw that really made this burger a winner. chili garlic slaw. Heat a large skillet over low heat and add the olive oil. Add the garlic and cabbage, tossing well to coat and cook for about 1 minute, continuously stirring. Add the chili powder, brown sugar, and sriracha, tossing well to combine (I like to use kitchen tongs to pick up and turn over the cabbage). Remove the cabbage and place it in a large bowl, adding the lime juice and again tossing well. Place the bowl in the fridge so the slaw can cool completely (unless you’d like it warm, but I love coleslaw on a warm burger). In a bowl mix together the ground turkey, salt, pepper, smoked paprika, garlic cloves and green onions until just combined. Gently mix until just combined and form into 4 equal sized patties. Heat a large skillet over medium-high heat and add olive oil. Add the patties and cook until brown on both sides, about 5 minutes per side. Or you can grill the burgers or cook them however you’d like. To make the creamy gorgonzola, combine the yogurt, 4 ounces of the gorgonzola, oil, salt and pepper together in a bowl and stir and mash until combined. Spread the mixture on top of the burgers before serving and crumble the remaining cheese on top. Top with a big handful of the chili garlic slaw and serve on toasted buns. That Jaimie Oliver dude sure knows how to make a scrumptious meal, doesn’t he? And you can always be sure that it’s healthy. Well, healthy as a juicy burger can get, anyway. So, for those of you who are living under a rock and don’t know what Five Guys Burgers and Fries is, let me school you a little. It’s an awesome chain of restaurants with only ONE item on the menu: burgers. But they have side fries, too. Delicious, crispy, home fries that they literally just pour into a giant paper bag and hand over to you. But their sandwiches are homemade, as well, right in front of you and I’ve yet to taste a better burger. So, so good. Anywho, here’s a copycat attempt. Be sure to Follow Raining Hot Coupons on Pinterest for more RECIPES! Heat oven to 425 degrees F. Place the bacon on a baking sheet and bake until crispy, about 10 minutes. Place the butter in a saute pan over medium heat. Add the mushrooms and onions and saute until caramelized, about 10 minutes. Remove from heat. Make 4 patties out of the ground beef. Heat a griddle to medium heat and place the patties on the hot surface. Season with salt and pepper. Cook until edges are cooked. Flip and cook another few minutes, until the burgers are done throughout. To assemble the burger, place the bottom half of bun on a plate. Add mayo, mustard, or other condiments. Place a burger, top with cheese, then another burger and cheese. Top with bacon and sauteed veggies. Place the top of the bun on the burger. Bison meat is a category all of its own. It’s a heady meat, with tons of flavor, so much that you barely need to add anything to it. But in the form of a patty, it’s good to top with veggies, cheese, and grilled onions. Heat 1 tablespoon oil in heavy medium skillet over medium- high heat. Add onions, sprinkle with salt, and sauté until tender and golden brown, stirring often, about 10 minutes. Reduce heat to medium and continue to sauté until very tender and well browned, about 15 minutes longer. Add wine and cook, stirring occasionally, until liquid is absorbed, about 5 minutes. DO AHEAD: Can be made 3 days ahead. Cool, cover, and chill. Preheat broiler. Gently mix meat and next 3 ingredients in large bowl. Shape into four 1/2-inch-thick patties. Heat remaining 1 tablespoon oil in heavy large skillet over high heat. Sprinkle burgers with salt and pepper; add to skillet. Cook until well browned, about 2 minutes per side for medium-rare. Open buns and arrange, cut side up, on a rimmed baking sheet. Place cheese slices on bun tops. Broil until cheese melts and bottom halves are lightly toasted about 1 minute. Spread bottom halves with mustard. Top each with a few escarole leaves, then a burger. Spoon onions atop burgers, dividing equally. Cover with bun tops; press lightly. A lot of these recipes are stuffed patties. Meaning; the meat is packed with ingredients inside. So here’s a quick visual of how to properly get those yummy items securely in the center. Take about 3 oz of ground beef and flatten it in your hand. Take a good bit of crumbled habanero cheddar cheese and put it on top of the beef. Add 1 slice of crumbled bacon on top of the cheese. Using your fingers bring the edges of the beef patty up around the cheese and bacon stuffing. 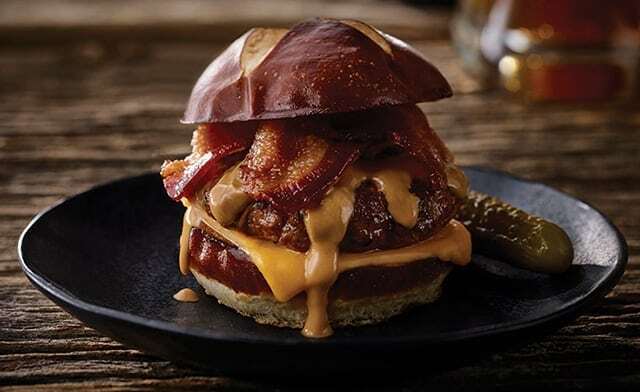 Make sure the cheese and bacon are overloaded inside this slider! Seal the top and form it into a neat slider patty. Be sure it is sealed well. Pour Worcestershire sauce all over the uncooked slider patties. Grill sliders over medium or medium high heat. Place on slider rolls and serve. All of the café dwellers and hipsters looked up when you said that. Coffee-rubbed meat? Could that be good? Well let me tell you, it most definitely is. The coffee does something to the beef, makes it…peppier. Then the addition of things like Dr. Pepper BBQ sauce, brown sugar infused this and that, peppered bacon, apple cider vinegar, etc. makes this one sinfully good burger. Oh, and don’t forget the soft pretzel bun. Combine coffee rub seasoning mix ingredients in a small bowl and mix together with a fork. Set aside. Melt butter over MED heat in a saucepan. Add onion and garlic and saute until soft and translucent, about 8-10 minutes. Add remaining sauce ingredients, stir to combine. Bring to a low boil, reduce heat and simmer for 20 minutes, until sauce has thickened. Pour sauce into blender or food processor and puree. Set aside to cool. To a mixing bowl, add ground beef, salt, pepper and 2 Tbsp cooled bbq sauce. Mix well with your hands. Divide into 4 equal sections. Each burger will be 1/2 pound. Rub coffee rub seasoning mix over both sides of each burger. Heat a large skillet over MED-HIGH heat, add a small pat of butter and toast the pretzel buns (sliced side down). Remove from pan to cool. Add 1 Tbsp butter to skillet and add burgers. Cook for about 4-5 minutes per side, until burger is cooked to desired doneness. Spread BBQ sauce over both sides of pretzel bun, layer arugula, burger, peppered bacon, then add the top bun. This may appear like a simple sandwich, but it’s really quite unique. Mixing the elements of yummy French onion soup with a beef patty and onions makes this so juicy and almost cozy. A great burger for a cold winter night. In a heavy-bottom saucepan, melt butter. Whisk in flour, stirring constantly, about 2 min. The mixture will bubble. Do not let it brown. Whisk in hot milk, making sure there are no lumps and mixture is smooth. Continue to stir as sauce thickens. Bring to a boil. Add salt and pepper, lower heat, and cook, stirring for 2–3 min. Remove from heat. To cool this sauce for later use, cover it with plastic wrap. Set aside. Peel onions and cut them in half, lengthwise. Cut into thin half-moon slices. Over medium heat, sauté onion with 4 tbs. olive oil and thyme sprigs until caramelized. Add stock and cook until most is evaporated. This may take about 20 min. Remove thyme sprigs. Salt and pepper. Set aside. Heat a grill pan over high heat. Lightly brush pan with olive oil. Generously salt and pepper both sides of each burger. 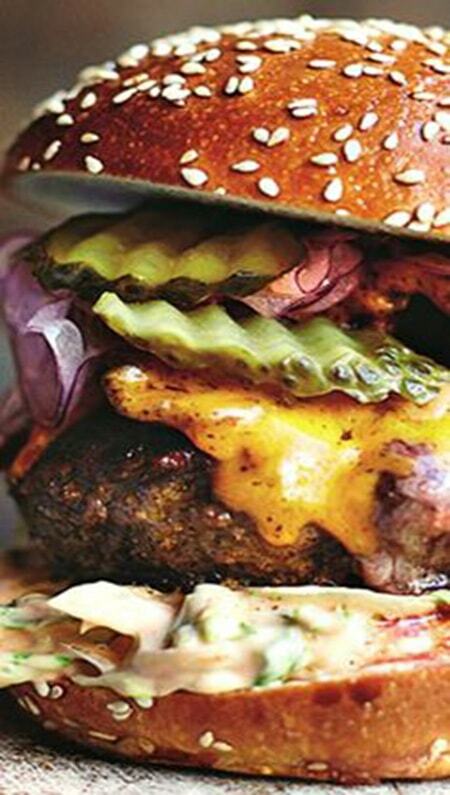 Place burger on grill pan and cook 5–6 min. each side for medium burger. After burger is flipped, place cheese on top and cook until desired internal temperature is reached and cheese is melted. Split the English Muffins with a fork. Toast and butter each side. Then, layer on a tbs. of béchamel sauce, followed by meat and sautéed onions. No doubt that the chain of diner style restaurants is rapidly growing in popularity, and for good reason. Their menu items are so freakin’ good. 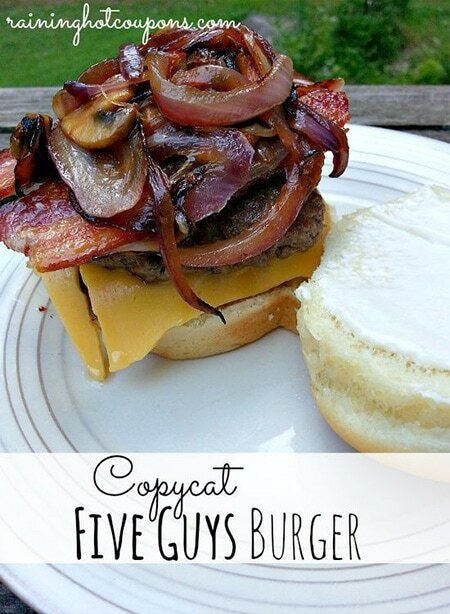 This copycat double-double burger is a prime example. So many fresh veggies and tons of cheese. 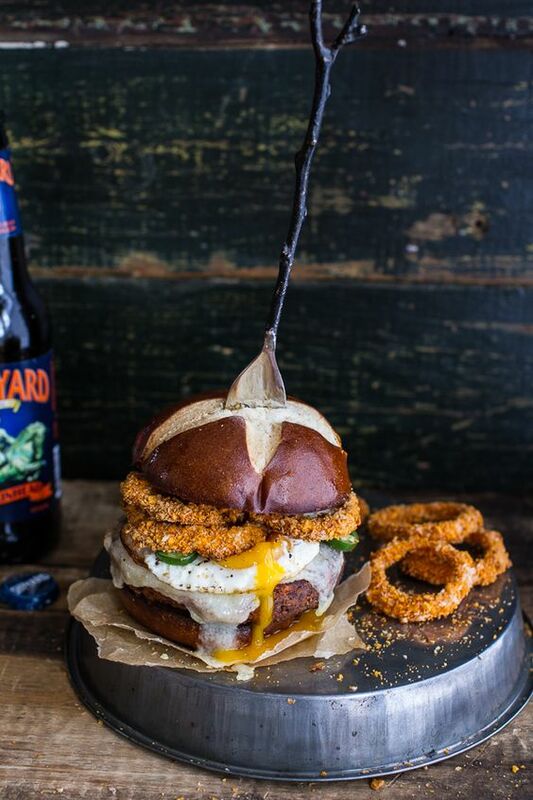 Okay, if you like face-melting food then this is the burger for you. It is delicious, but definitely not for those who are blown away by a kick. Everything about this sandwich is spicy; spicy beef, jalapeno cheese, spicy candied bacon, and chimichurri mayo. Mix all the spices in a small bowl and sprinkle it all over the ground beef. With “loose” fingers (keeping all your fingers spread out), gently toss the ground beef to mix in the spices. You do not want to over handle the meat. Leave to marinade for a few hours if you can, but it can be used right away too. Divide the beef into 4 portions (4 oz each) and gently flatten them out into patties with a 4-5 inch diameter. With your thumb press down gently in the middle of the patty to create “a dimple” on each patty. Heat a grill or non-stick pan on medium- high heat. Brush the surface with some oil (especially if you are using lean meat). Cook each burger patty on medium – high heat (you should hear a good sizzle), for 1 minute per side. Lightly sprinkle salt on the uncooked side. 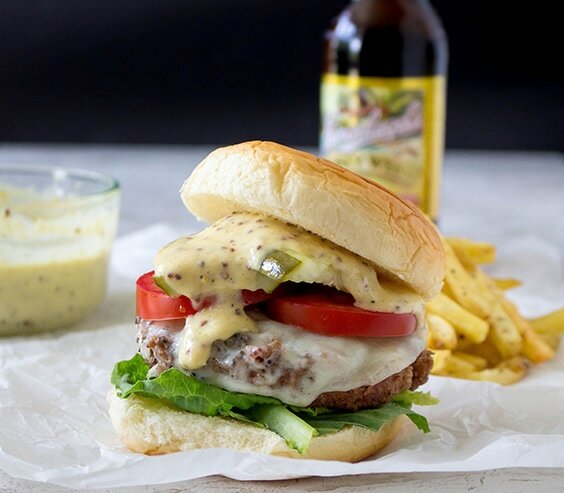 Flip the burger and immediately place a portion of the beer and jalapeno cheese on top and cover the burger with a lid to allow the cheese to melt for 1 to 1 and a half minutes. As these burger patties are relatively thin, they cook very quickly, without drying out. Please see note. When the burger is cooked through, place it on a plate to rest for a few minutes. Beer and Jalapeno Cheese In a saucepan, place the 1 cup of beer and bring it to a boil. Reduce the heat allowing the beer to reduce to about a ⅓ of a cup. Mix the cheese, cornflour, and paprika in a bowl. Add the cheese mix into the beer and allow the cheese to melt smoothly. If needed add a little milk or cream. Fold in the jalapeno pieces and add salt and pepper to taste. Let it cool down, and divide into four portions to use on the burgers. Chimichurri Mayonnaise In a small food processor combine the cilantro, parsley, garlic, chili and balsamic vinegar and pulse until the herbs are chopped finely. You can chop the herbs before adding to the processor to make the mixing easier, depending on what type of food processor you have. Add the yolk to the herb mix and mix it well. While the processor is running, add ½ a cup of oil in a thin stream until you have an emulsified thick mayonnaise like paste. If needed add the rest of the oil in a thin stream to get the right mayonnaise consistency. Add salt to taste. Please see note on mayonnaise. Keep in an airtight bottle in the fridge but use within 4 days. Assembly Place 2 burger patties on the bottom burger bun and top them with spicy candied bacon, tomatoes, onions, pickles and lettuce. Generously spread the chimichurri mayonnaise on the top burger and place it on top of all the toppings. Serve with your favorite beer and fries! When mixing the meat for this burger, toss in some crushed Doritos instead of breadcrumbs. Then, fill the center with pepper jack cheese. After that, you really don’t need anything else, not even a bun, in my opinion. But then you’d just look like a savage. Combine crushed chips with the meat and egg. Mix until all ingredients are well incorporated, bur don’t over mix the meat. Divide the meat into ¼ C portions and flatten into about ½” thick patties. Use the back of an ice cream scoop to indent the middle of each patty and place 2 tbsp of the cheese in 5 of the indentations. Cook over medium high heat on a griddle or grill, about 6 minutes per side for well done. Serve with the usual hamburger toppings and don’t forget to take a bite while the cheese is hot, melty, and juicy! So here’s another healthy vegetarian alternative using black beans again. It’s a juicy mouthful, for sure. Especially with the shredded butternut squash and melted pepper jack cheese. But my favorite was the poppy seed onion buns. Next mash black beans in a large bowl and set aside. Alternatively, you can use refried black beans, I’ve made it both ways! Measure to ensure you have a cup and you’re good to go. Cook for a few minutes on each side until you’re left with a golden crust. and a warm center. Repeat for each burger, or cook two at once if you have a big enough pan! I’d skip crowding all four together just because they’re a pain to flip when all up in eachother’s business. A tip for perfectly shaped veggie burgers? While sizzling away in the skillet, I use my spatula to gently help form the sides into a perfect disc. Works like a charm! Notes: The burger itself is naturally vegetarian, vegan, and gluten-free, so choose your favorite toppings and have fun with it! This is as light, fresh, and zesty as a burger can get. 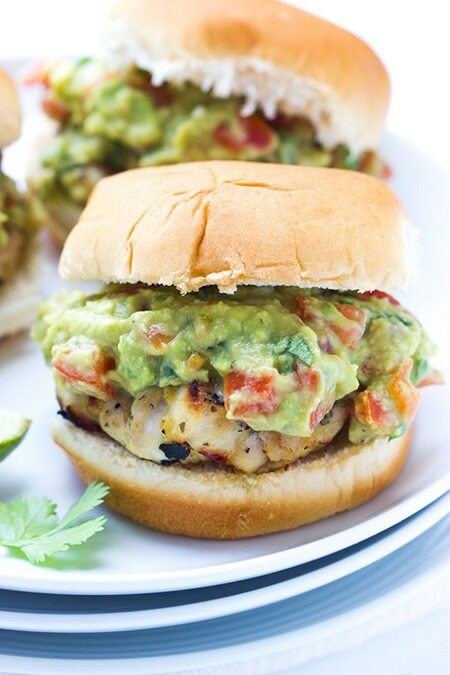 A lean chicken patty infused with lime and cilantro, then topped with tomato guacamole. This recipe makes sliders, but you could totally make it on a large scale. Light and spicy pretty much sums up this recipe. You could form a patty using ground chicken, or you could just grill up a whole breast. Whichever you prefer. I’m not a huge fan of blue cheese so I switched it out for Mozza. Heat your grill (or grill pan) to medium-high heat. Remove the bowl from the refrigerator, divide the meat into thirds, and form your patties. 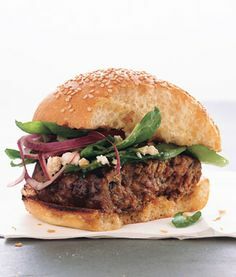 Grill the burgers for 3 to 4 minutes per side (depending on the burger thickness), or until they reach an internal temperature of 165 F.
Serve the burgers on the kaiser rolls, with the baby greens and blue cheese sauce. Everyone loves a good chicken parmesan recipe. But who would have thought it’d go good on a burger? Well, someone did and the results are superb! Again, you could use ground chicken or grill up a whole breast, whichever you prefer. In a medium bowl, mix together the ground chicken, bread crumbs, Parmesan cheese, garlic powder, Italian seasoning, and egg using your hands. Form into four equal-sized patties. Meanwhile, heat saucepan over medium-high heat. Add olive oil and garlic. Sautee garlic for 3-5 minutes until fragrant. Add tomato sauce, paste, sugar and dried basil. Stir until combined and heated through, about 10 minutes. Reduce heat to low until burgers are ready. While sauce is simmering, grill chicken burger patties over medium-high heat, about 5 minutes per side. During the last minute of cooking, top each burger with a ¼ cup of mozzarella. Heat until slightly melted. If you do not have access to a grill, you can easily cook these burgers in a skillet. Find those directions here. Place burgers and sauce on split buns. Serve immediately. 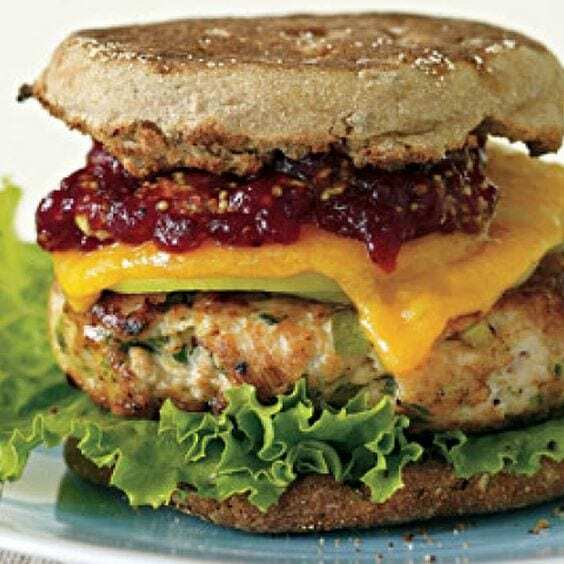 Everyone loves Oprah, and they love the things she recommends, this turkey burger is one of them. But even if the daytime TV Goddess didn’t vouch for this recipe, I’d still make it. It looks delicious. A whiskey glazed blue cheese burger. Need I say more? Yeah, I probably should. Hmmm, let’s see. Grilled onions, saucy Dijon mustard, Guinness, and a soft pretzel bun. Is that enough words? Heat butter in a large skillet over MED heat. Add sliced onions and stir to coat in melted butter. Sprinkle in salt, pepper, and thyme and stir to combine. Saute, stirring occasionally, for about 7-10 minutes, until onions are soft and golden brown at the edges. Pour in half the Guinness, cover, and cook until liquid is about 3/4 of the way evaporated. Repeat with remaining Guinness. This time, cook until liquid is nearly all evaporated. Remove onions from pan and set aside. To a small saucepan, add whiskey and bring to a low boil. Continue to boil for about 2 minutes, then add remaining glaze ingredients and whisk to combine. Reduce heat to LOW and simmer for 5-7 minutes, until glaze is slightly thickened. To a large mixing bowl, add ground beef, salt, pepper, and dried minced onion. Use your hands to mix it all together. Separate the meat mixture into 4 equal portions. Shape meat into flattened balls, place about 1 Tbsp blue cheese crumbles in the center of the ball and push into the ball. Mold the meat around the cheese and form into a patty. Heat a large cast iron skillet or grill pan over MED heat. Drizzle a bit of olive oil in the pan. Cook burgers about 6 minutes per side, or until desired doneness. The last minute of cooking, brush burgers with prepared whiskey glaze and place a slice of cheese on the burgers, then cover pan loosely with foil. Remove burgers to a plate and cover with foil for 3 minutes. TO SERVE: Line bottom bun with arugula lettuce, then top with burger. 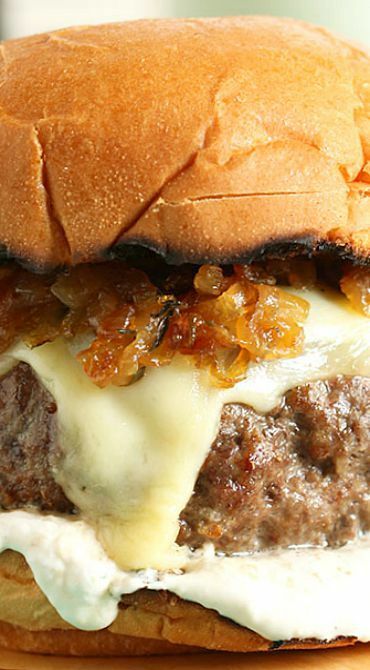 Place a generous helping of caramelized onions on top of the burger, then drizzle with additional glaze. Top with top bun and enjoy! Again, with the black bean patties. These particular ones may look more like bird seed, but they’re jam-packed with vegetarian goodness. These patties can be topped with just about anything, too. Preheat oven to 375F. Lightly grease a baking sheet. Combine flax meal and water in a small bowl; set aside in the fridge. To cook quinoa, heat 1 teaspoon of oil in a small saucepan over medium heat. Rinse quinoa in a small mesh strainer. Once oil is hot, add quinoa to the saucepan and stir. Cook for 1-2 minutes until lightly toasted. Add 1 cup water; turn the heat to high. Once boiling, reduce heat to low, cover, and simmer for 13-15 minutes. *Meanwhile, heat 1 tablespoon of oil in a skillet over medium heat. Once hot, add chopped onion; let it cook for a few minutes, stirring often. Add bell pepper, jalapeño, and garlic; cook until the onion is translucent, about 2 minutes. Add the spinach and stir immediately, letting it wilt slightly. Turn the heat off. In a large bowl, add black beans; mash with a fork, leaving some texture. Add cooked quinoa, sautéed vegetables, salt, paprika, cumin, pepper, cayenne, and reserved flax eggs. Mix until combined, then add oat flour. Stir. Form 10-12 patties depending on desired size (see notes for a cool little trick!). Place on baking sheet; bake for 20 minutes, flip, then bake for 25-30 more minutes, until browned and crispy. Serve on a whole-wheat hamburger bun with guacamole, barbecue sauce, and other desired toppings, or on top of a salad. NOTES: You don’t have to sauté the vegetables, but I think it really brings out the flavors better. If not sautéing, simply mash them directly in the bowl with the black beans and other ingredients. To get evenly shaped burgers, line the lid of a jar (I use a peanut butter jar lid) with wax paper or foil. Stuff the lid with the burger mixture, then flip it over onto the baking sheet and remove the wax paper. Honey BBQ sauce, tons of bacon strips, melty cheddar cheese, and an all beef patty on a whole wheat bun. (whole wheat because you have to at least TRY and watch your figure, right?) The thick slice of avocado makes me want to take a bite of this picture. Mix together sauce mix and beer in a small bowl. Set aside to thicken. Cook bacon in a pan on medium high heat until crisp, set aside. 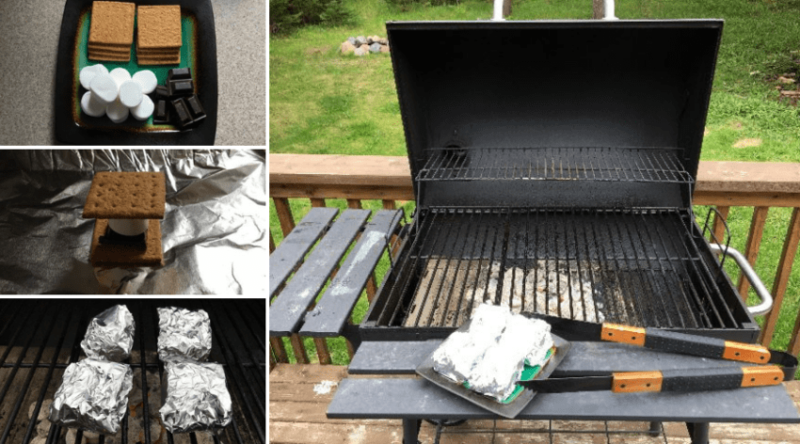 Preheat barbecue/grill to medium high heat. In a medium bowl combine ground beef, egg, garlic powder, salt pepper and Worchester sauce. Form beef mixture into two patties and place on center of grill. Cook 5 minutes (or until bottom is charred) then rotate and cook other side to desired doneness, about 5 minutes more. Top with cheese to melt. Toast buns if desired and spread with BBQ sauce, and top with burger patties, bacon, lettuce and avocado. Remember how we talked about stuffing your burger patties? Use that info and jam some jalapenos in there, too. It’s like biting into a creamy jalapeno popper on a bun. Preheat grill to medium or oven to broil on high. In a small bowl combine cream cheese, cheddar cheese, garlic powder and diced jalapeno. Combine meat, salt & pepper and minced onion. Divide meat into 4 even pieces (7oz each). Take ¼ of the cream cheese mixture and flatten it into a pancake shape. Wrap beef or turkey around the cheese ensuring the cheese mixture is completely covered. Brush each burger with a little bit of olive oil. Okay, just one more healthy veggie option before we go. This patty is made with chickpeas and sweet potato, which gives it more of a sweet taste than a tangy one. 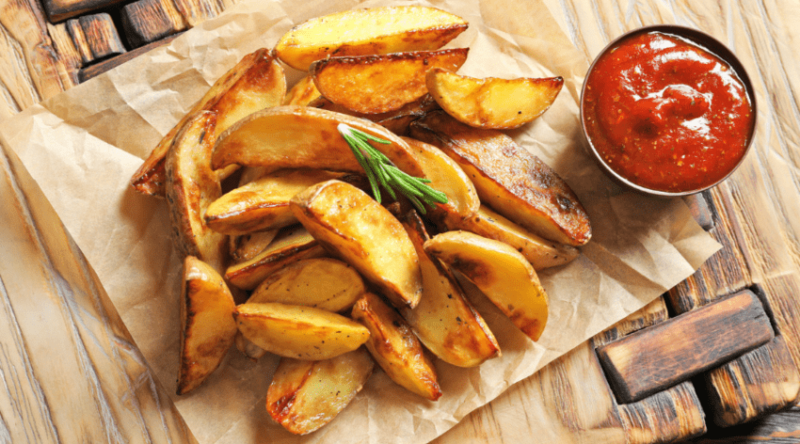 When you grill it, the potato gives it a bit of a crunch, too. So good! While they cook, use a large wooden spoon or potato masher to partially mash the beans, but not fully. You can also lightly chop them in a food processor or blender if desired, but the texture from the beans is great so try to keep them chunky. The whole beans give the burgers a meaty texture that makes me feel like I’m eating a traditional burger. Only they’re healthier… and more flavorful… and yes, just plain awesome this way. For the oats, they can be left whole or “chopped” by grinding them in a blender or food processor. If you’re sneaking them past a picky friend or family member, pulsing is the way to go, if you’re pressed for time, toss them in whole! I’ve had luck both ways! In order to gauge how much of the oats to add, start by adding 1 and 1/2 cups and mix thoroughly. Next, take a look at your mixture. It should be a little on the chunky side and slightly sticky. If it feels too wet to form into proper veggie burgers you’ll want to add an extra half cup. Ready to eat? Pour a teeny bit of oil in a skillet, heat to high, and cook for a few minutes on each side until you’re left with a golden crust and a warm center. Cook a few at a time, trying not to overcrowd the skillet, it’ll be easier this way. I typically make one burger right away and then leave the remainder in the fridge overnight. The following day I cook up the rest of the burgers and split the batch between the fridge and freezer. To freeze: simply cook the burgers as indicated above, allow to cool a bit, and then freeze [spaced] on a plate or cookie sheet. Once they’ve had a chance to partially freeze you can pile them in baggies or your favorite airtight container for fast food without the freaky ingredients. We’ll end it off on an easy note. This basic, cheese stuffed beef patty is effortless to whip up on any night. Toss in a few fresh veggies and some cheese and you’re good to go! Place the minced beef into a bowl and break it up slightly, then season with salt (I use about ¼ tsp). Cut the cheese (60g) into 4 equal-sized squares. Divide the mince into 4 balls. Take half of one of the balls and form it into a circle about 6cm wide. Push a square of cheese into the center so that the mince comes about halfway up the side of the cheese. Form the remaining half of mince into a circle with the same width and carefully put in onto the top. Gently pinch around the edge to join the top to the base and then use your hands to form it into a circle (if it’s become a little misshapen). Cook your burgers on the barbecue or grill for about 15 minutes until cooked through, turning halfway through the cooking time. Did you like our list? Is there a nice puddle of drool sitting in your lap? Hopefully at least one of these awesome and unique homemade burgers has inspired you to get creative in the kitchen this weekend. We’d love to hear how yours turned out! Comment and share, we love to hear our readers’ recipe attempts! 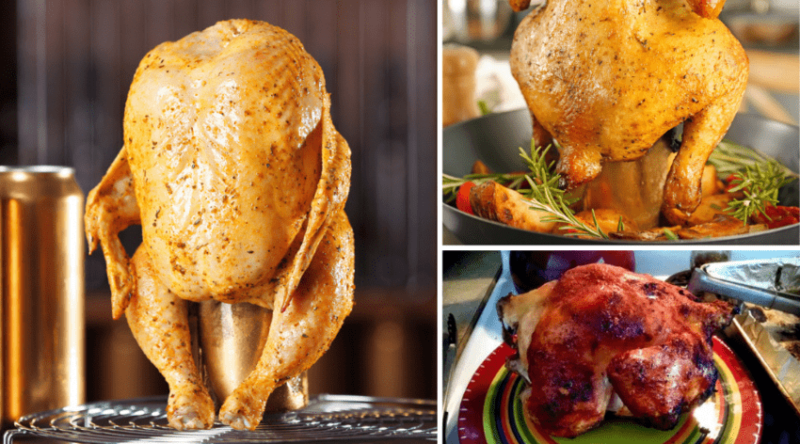 17 Winter BBQ Recipes: #7 is to Die For!